The AfD and other euroskeptic parties are forming a bloc ahead of the elections for the European Parliament. Various anti-immigrant youth organizations recently gathered in Rome, giving a sense of what might be to come. Euroskeptic parties are joining forces ahead of the elections for the European Parliament in May. A few days ago, about 500 young members of such parties met in Rome. 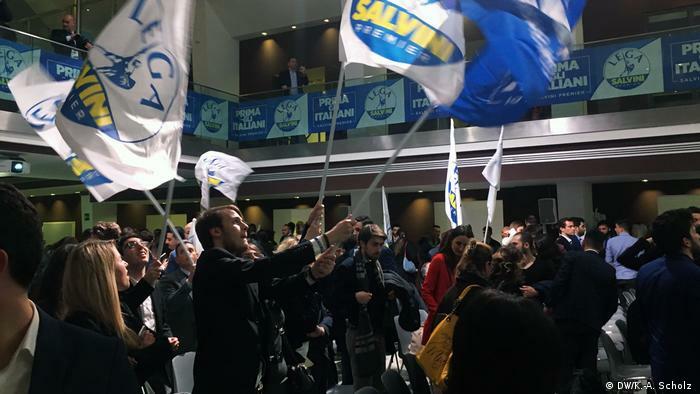 The summit was organized by the youth wing of Italy’s anti-immigrant League party, which hopes to win a large share of the vote. Surveys indicate that Italian Interior Minister Matteo Salvini‘s party could emerge victorious in Italy. And for months, he has been working to unite Europe’s various right-wing populists. From the outside, nobody would have guessed that hundreds of young far-right activists from across Europe were gathered in an upscale hotel in Rome’s Via Palermo. Outside the establishment, there were neither protests nor road blocks that could have indicted what sort of event was being held inside. The summit was attended by the heads of Belgian, French, German and Austrian far-right youth organizations. Among them: Damian Lohr, who a year ago took over as the head of the youth wing of the Alternative for Germany (AfD) party. Currently, Europe’s right-wing populist parties are spread across three different groups in European Parliament. They are members of either the European Conservatives and Reformists (ECR), the Europe of Nations and Freedom (ENF) or Europe of Freedom and Direct Democracy (EFDD) bloc. In the past, they struggled to cooperate for a number of political and personal reasons. 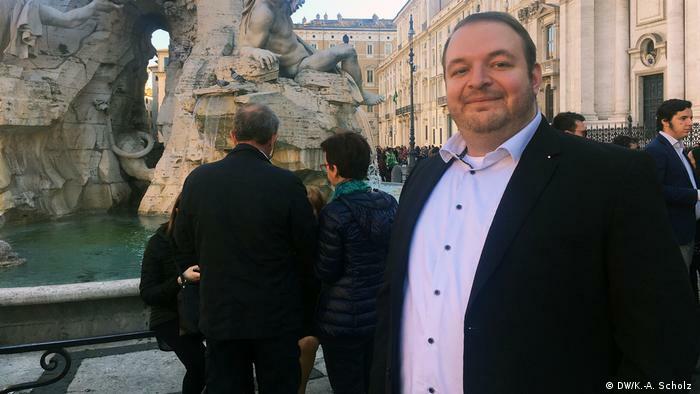 But now, with just weeks to go until the European parliamentary election, Europe’s nationalists want to overcome their differences and join forces. Germany’s AfD has already sent out invitations for a press conference to be held April 8 on the matter. It will again be hosted by Italy’s League party. AfD party leader Jörg Meuthen is set to attend the event. Media reports indicate up to 20 different political groups and parties intend to join the new “Alliance of European peoples and nations.” And Salvini has planned an election campaign that will even take him to Germany. He has already been to eastern Europe in previous weeks. It is unclear if Poland’s ruling Law and Justice (PiS) party will join the new right-wing group as it has refused to comment. Europe’s far-right hopes to become the third or even second most powerful group in European Parliament. Though it is increasingly difficult to project how the election will turn out — in particular because it is unclear whether Britain will participate in the election. Either way, Europe’s nationalists could win up to one-fourth of all parliamentary seats. The Rome summit of right-wing youth organizations, meanwhile, gave a sense of what might happen when Europe’s far-right unites. Vast League party flags adorned the scene, AC/DC’s “Thunderstorm” could be heard blaring out of the PA system, and iconic sites from various European capitals were projected onto a huge screen. Davide Quadri, the League’s youth branch international coordinator, welcomed attendees to the summit, telling them his organization’s goal was to “Make Europe great again.” Speakers from across Europe then took to the stage, lashing out against Brussels, multiculturalism and immigrants. All of them extolled the virtues of “pride” and “patriotism,” stressing that the EU must be revolutionized. An hour into the event, Damian Lohr’s moment had come. He railed against EU Commission President Jean-Claude Juncker, calling him a clown, and branded Germany Chancellor Angela Merkel a witch. Though compared to Bart Claes of Belgium’s Vlaams Belang Jongeren, Lohr’s criticism seemed almost tame. Claes said that nations must never apologize for their history. Lohr, meanwhile, looked unfazed by this demand, which not even extreme AFD members would dare utter in public now that Germany’s domestic intelligence service is on their case. Three hours later, the summit came to a close. Many attendees headed up to the stage to snap selfies with their political idols. Lohr and others were happy to oblige. 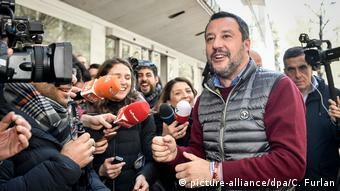 The next day, while strolling though the Italian capital, Lohr told DW that he was surprised just how emotional the youth wing summit had been. He seemed almost intoxicated by the atmosphere. Was he was worried that feelings of pride and patriotism, as extolled at the summit, could some day give rise to an aggressive nationalism that could also take hold of Germany? Lohr took a moment to think and then replied that thanks to mutual respect and a sense of individual responsibility, there was no danger of a resurgent nationalism. Rome appears to have become Europe’s new right-wing populist epicenter. The Eternal City, with its countless imperial monuments, could not be more different to Brussels, with its modern architecture of glass and steel. The Roman Empire has had a lasting effect on Europe for two millennia — now Italian populists want to reshape the continent in their own image.